Note: The following commentary on middle-wage or middle-skill jobs was written by Scott Sheely, one of EMSI’s longtime workforce development clients. 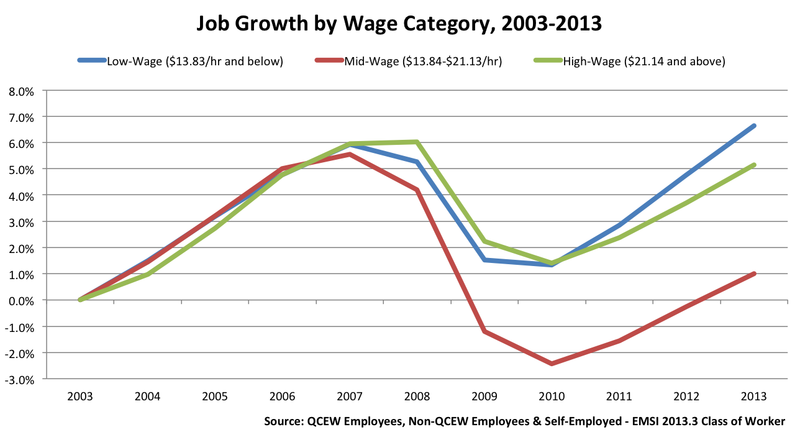 EMSI wrote about trends with middle-wage jobs in October. For more on Sheely, visit the Lancaster County WIB website. A PDF version of this article is available here. Over the last two years, a flurry of articles in the professional literature (Autor, 2011; Abel and Deitz, 2011; Tuzemen and Willis, 2013) has once again brought the health of “middle-skill or middle-wage” jobs in America to light. These recent studies offer additional quantitative detail to earlier works by the Brookings Institution (Sommers and Osborne, 2009) and the Workforce Alliance (Holzer and Lerman, 2007) that described the scope and nature of this category of jobs. Interpreting the recent research can be difficult because much of it has been done by people with a national or broad regional point of view and with a bent toward valuing formal education. There are a variety of ways to define middle-wage jobs but most approximate the wage numbers used by the National Employment Law Project — from $13.84 to $21.13 (Berhhardt and others, 2012). There is no doubting the numbers, which say that middle-wage jobs are not growing as fast as low-wage and high-wage jobs (see the following chart from EMSI). However, there are a number of factors that may complicate the way we interpret this trend. National data may not accurately reflect what is going on with regard to middle-wage jobs in local areas. Local economies with concentrations of certain industries (manufacturing or health care) or that are growing (construction) or that are transportation hubs (logistics and transportation) or that capture natural resources (agriculture and mining) will probably have higher levels of middle-wage jobs in their occupational mix. Local economies that rely on tourism and retail will tend to have fewer. It’s hard to generalize nationally about middle-wage jobs. In America, we are in the midst of a major demographic transition as the Baby Boomer workforce changes its relationship to employment. There are a large number of workers from that generation who have not yet made the decision to retire, causing a pinch point in the pipeline of workers into middle-wage jobs, a situation that will resolve itself in time. Finally, there are many middle-wage jobs that are open for lack of people with the skills to fill them. There is a direct connection here to the issue of the “skills gap,” about which there is an ongoing national dialogue. One wonders whether an estimation of the opening (postings) for middle-skill jobs has been factored into any of the estimates. Middle-skill jobs are harder to define than middle-wage jobs. We tend to think we know them when we see them but it’s hard to describe them. They occur in virtually every industry sector, including manufacturing, construction, logistics and transportation, and energy but also in health care, finance, and business services. They include the people who do the paperwork, who run and repair the machines, who care for the sick, who drill for and distribute oil and gas, who fix our plumbing and electrical systems, and who assure the quality of our commercial systems is world-class. They are a part of career pathways – production, sales, administrative support, construction trades, health care, and technical support – that often do not require a four-year degree but do require training after high school (Sheely, 2013b). Middle-skill jobs are increasingly science, technology, engineering, and math (STEM) jobs requiring a solid educational foundation. See the work of the Brooking Institution’s Jonathan Rothwell (2013), who speaks to the issue of broadening definitions of STEM jobs (and including more middle-skill jobs). However, the training that is required is often tacit or “hands-on” or experiential and best done with demonstration and coaching from an experienced supervisor or co-worker. There is a great deal of skill transferability among middle-skill jobs. Attributes such as observation, attention to detail, ability to recognize data in charts and graphs, the ability to find information in written narrative, and the ability to use tools and apply technology are as much a part of the work of a welder as they are a bookkeeper or a nurse. For those of us in the workforce world, the information that comes out of this recent research has great applicability in our everyday practice. In our role of preparing people to engage employment, our systems need to be much more sophisticated about career pathways as well as the occupations and skills that comprise them — and not the career pathways that come out of the education world but rather career pathways that are based on data and validated by employers. Drilling down to occupations and skills will help us provide the information that the jobseekers and trainees with whom we work need and guide them toward the right training. Middle-skill and middle-wage jobs will be an important part of those conversations given their important place in all career pathways. Finally, nearly every workforce investment board in the nation runs a youth program that focuses on career guidance and skill development for the next generations. Often, our educational partners have a different idea of what employers will require from the future workforce. Workforce professionals have an obligation to lift up middle-skill and middle-wage jobs as viable alternatives for the many bright kids out there (and their families) who are forced in one way or another to a four-year college only to find a great amount of debt and no opportunities in the career that they have chosen. Workforce professionals need to be truth-tellers as parents and students consider their future. Encourage other parents and their children by your example with your own family to consider career pathways that include middle-skill and middle-wage jobs. Holzer, Harry and Lerman, Robert. American’s Forgotten Middle-Skill Jobs. Washington, D.C.: The Workforce Alliance, November 2007. Rothwell, Jonathan. The Hidden STEM Economy. Washington, D.C.: Brookings, June 2013. Sheely, Scott. Another View of Career Pathways. Lancaster, Pa.: Lancaster County Workforce Investment Board, 2013b. Sheely, Scott. Temporary Employment and the Lancaster County Economy. Lancaster, Pa.: Lancaster County Workforce Investment Board, 2013a. Sommers, Paul and Osborne, Drew. Middle-Wage Jobs in Metropolitan America. Washington, D.C.: Brookings, June 2009. For more, email Scott Sheely or contact the Lancaster County WIB. Previous articles on the EMSI blog on Sheely’s work can be found here. Follow EMSI on Twitter @DesktopEcon.